Estimated value (2017): $2.8 million. *Based on past value and accounted for inflation & value appreciation. History: The painting was sold in a Christie's auction in 1981 for $881,496. 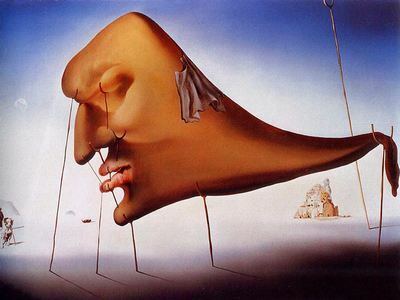 Salvador Dali was one of the foremost surrealist painters. The flamboyant Dali took inspirations from both classical art and contemporary art such as cubism and Dada. Some of his most famous works were interpretations of dreams or state of sleep. The Spanish painter also ventured into cinema, partnering with filmmaker Luis Buñuel to create two surrealist short films titled Un Chien Andalou and L'Age d'Or. The painting depicts Dali's interpretation of sleep. Note how fragile the state of one’s sleep is. If any of the crutches breaks or collapses, the dreamer will awake. There is one towering crutch that does not support any object. This shows how something seemingly unrelated to one's state of sleep could have an effect on it. The painting's background and the cameo of a crutched canine look like a scene straight from the Arabian Nights. This might be related to some of Dali's personal interests at the time. The painting makes use of color contrasts to create a dream-like atmosphere and hyper reality.